Tara Labs is an American audio specialist dealing only with cables. Because we test their products from time to time, and I use some of them myself, this name is not unknown to our readers. Also the name Omega Onyx did appear – please look at the reportage from the Krakow Sonic Society meeting from last month (in Polish HERE). Also the previous version of that cable, named Omega, passes through our texts here and there, as it is the basis of Janusz’s system, one of my friends from KSS. 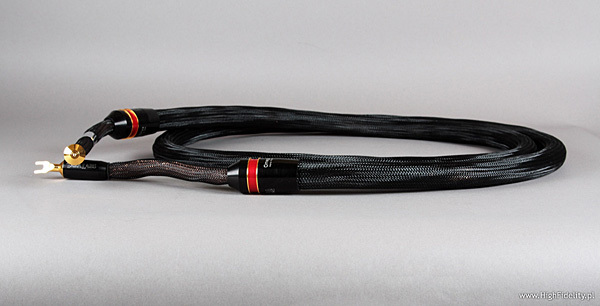 The cable Zero, belonging to the highest series (“Stereophile” talks about Extreme Series, ref. HERE ), was, until recently, the only one in this group. However market demands made Tara differentiate their offerings, also on the top level, and now they offer four models within the series: Cobalt, Gold, Onyx and Edge (beginning with the best one). The engineer responsible for their design, Matthew Bond, assisted by the factory manager, Matthew Sellars, claims, that the better the cable, the better the articulation, while the general sound character remains same. This time we test the Omega Onyx, a cable to be the equivalent of the older Omega, with more conductors and improved isolation. Bill Evans&Jim Hall, Intermodulation, Verve/Universal Music Japan, UCCV-9342, CD. Carol Sloan, “Hush-A-Bye”, Sinatra Society of Japan, XQAM-1031, CD. Danielsson/Dell/Landgren, Salzau Music On The Water, ACT Music + Vision, ACT 9445-2, CD. J. S. Bach, “Brandenburg Concertos”, Academy of Ancient Music, Harmonia Mundi, HMU 807461.62, 2 x SACD/CD. Perry Como, Perry Como In Italy, BMG/Sinatra Society of Japan, XQAM-1015, CD. Piotr Anderszewski, Piotr Anderszewski At Carnegie Hall, Virgin Classic, 267291, 2 x CD. Thelenious Monk, Briliant Corners, Riverside/Universal Music Japan, UCCO-9220, CD. Tara gives an incredibly saturated sound. 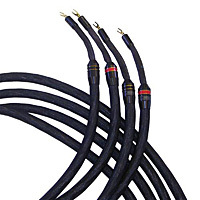 Compared to the Omega, all other loudspeaker cables known to me sound “thin”. Changing from my Velum (Velum NF-G SE + LS-G - in Polish) to the Tara immediately showed, for what we need to pay in its case, still the basic changes were easiest for me to describe using acoustic recordings, like those from the discs Hush-A-Bye Carol Sloan and Salzau Muisc On The Water Danielsson/Dell/Landgren trio. Because the sounds coming from the midrange make biggest impression – this is why Sloan vocals was so beautiful in its presence and palpability, as was the Landgren’s trombone. Never before it happened, that switching from the Velum to another cable I would be so enchanted, absorbed and fully for “Yes”. Never before! I tested cables better than the Polish reference, that I use for a few years, like the Harmonix HS-101 ESQ Exquisite, Acrolink Mexcel 7N-S20000, and to some extent also the XLO Limited Edition LE-5 – but I never had the impression, that the money, that I would need to spend (because the Velum is much, much cheaper than all of them) would result in an “increase of satisfaction”. This does not mean, that in other systems, for different listeners, this must look the same, but for me the case was clear and I did not even want to think about a new cable. Anyway, it was different with the Omega. I know it through and through (actually its classic version called simply ‘Omega’, which is slightly worse than the Onyx), because it is part of Janusz’s system, the system we use for the Krakow Sonic Society meetings. Its assets, being the phenomenally even sound and incredibly deep timbre were easy to predict. But only when I listened to what this cable does in my system, made me a headache. Not so long ago I declared, that I want to have the power cable Acrolink 7N-PC9100, the interconnect 7N-DA6300 from the same company, as well as the preamplifier Polaris II Ayon. Each one of those changed the sound of my system radically, and I almost cried, when I knew what I am losing while returning those after testing. It is similar with the Tara, only this cable does it more subtly. Changes we get using it are undisputed, but the assets will be noticeable in the right perspective only when we get back to our own cables. This will be like sudden information about us being fired – unpleasant and making us sick. I would not like to put those events in parallel from the moral and social perspective, after all this is just a cable, and you can live without it, but engaged lovers of anything, and audio is something you can be a lover of, will know what I am talking about. The changes brought by the Omega Onyx are structural, not superficial, this cable does not “improve” anything, compared to what we had before, and does not “finish” things started, and does not “facilitate” listening. It just offers a completely different view on the same musical event. Before I started the listening tests I had imagined, what Tara Labs can change in my system. It turned out, that I thought wrong, that I accessed the whole thing from the wrong angle. Because I imagined, that the Omega Onyx will smoothen the treble and will give more vividness to the whole. And the cable did that much more than I expected! But was also the case, that those things had no practical meaning, it was not “polishing” of something there. Those elements were better, because the whole sound was from another, reference level. When I tested my Velum a few years ago, I had the impression, that they do not include much in the sound. And I was not wrong, those are phenomenal, incredibly neutral cables. But in this case the differentiation between “neutral” and “natural” has more power and weight. A neutral cable, is one that adds nothing, or very little, from itself. This is of course an ideal situation, and in real life there exists a big margin of freedom, or rather deviation from the ideal. But I think, that such a “thought construct” like a “neutral cable” is possible. But neutrality tells only one thing: is there any “surplus” in the idealized, I mean compared to the idea of ideal sound, sound transmitted with that cable (or actually any product), or not. In theory this “neutrality” should work both ways, the “adding” and the “subtracting”, However in the audiophile idiom more attention is paid to the first one. This is a logical error, but there is no way of fighting the language, it is just about using it in a conscious way. I called upon this dichotomy, which would be a personality in the ideal world, because “neutral” products are rarely “natural”. The latter category profits from an allowance for some deviation from neutrality (I am talking about adding something from itself), under the condition, that we get something else, something, that is not simply “subtracted”. This can be fantastically heard, when we compare to the Velum. I will repeat this: I do not know another cable, for the given money, which would sound with such an even and phenomenally resolved sound. But the Tara Labs Omega Onyx shows what it “keeps” for itself, also when compared to cables like the tested or the top Acrolink. It is mostly about the incredible energy of the sound that we get with the American cables. The voices of Sloan, Perry Como (In Italy), or Beverly Kenney (Lonely and Blue) were full and had big volume. For a moment I thought, that the Omega brings the sound closer to the listener, but that was not the case – just a bigger, more natural sound, makes everything better visible and thus it seems to be closer than before. Those mentioned three discs come from a special company – Sinatra Society of Japan, which specializes in issuing unknown, forgotten, or even not issued discs from the 50-ties and 60-ties. The sound is phenomenal in its naturalness, but not always technically perfect. The Omega showed those two planes – recording and music – as good as almost no other cable did. Well, in my case, no other cable. Best of all. Much better than all the other cables I listened to. It may seem, that I started from the end, from the synthesis, without quoting the general rules, without analysis and that this is an error. But I think, that in hi-end products those are the most important things. But those are the result of individual layers, details, and I will call upon those. For the Tara the incredibly full midrange is most important. It is not bolded, like in the Zero interconnect, but is the result of showing the sound with a soft “belly”, the turning point between midrange and bass, which allows for creating such perfect, so credible virtual sources. This is also related to the incredible spaciousness of the cable. It is not as spectacular in this aspect as the mentioned Acrolink, because it does not go so much to the sides, or it does not suggest such a vast space BEHIND us, but defines better everything happening in front of us. This is not a definition that comes from hardening of the attack on the midrange, because this is the way Velum works. Here the definition comes from the three-dimensionality and fullness of the virtual sources. This is what makes them a solid element of the sound stage, and not something we just stumble over. The top range seems a bit smoothened, but this is probably only because of the incredibly saturated midrange. This is not senseless, because showing a stronger part of the sound spectrum, automatically makes its surroundings to be perceived weaker. The Omega does not bold anything, but compared to it, most cables have underlined details, without their saturation, what makes them seem brighter. Only the Harmonix Exquisite had a similar timbre, and probably a similar philosophy of the sound. The bass is incredibly saturated and beautifully, naturally soft. Because this is how everything sounds in real life. Velum can go lower, it has a better definition of the attack, what makes it incredibly attractive, but it is not as natural. The bas of the Omega shines with shades and colors, it is very differentiated in dynamics, etc. With the Velum, and other cables, the information is sometimes “stretched”, as if it would be pulled by force. With the Tara everything flows without any problems, without any constriction. The Omega Onyx from Tara Labs consists of two separate runs, each of them being very thick. The conductors are quite thin, but the main role in this construction is played by isolation and vibration damping materials, as well as the geometry of the cable. The conductors are made from SA-OF8N copper. Each channel has 168 RSC Gen2 conductors (Rectangular Solid Core) with a square cross-section, isolated with the Aero-PE GMI dielectric. Each conductor is placed in its own sheath, much bigger than itself, what makes big parts of its surface being surrounded by air, which is one of the best dielectrics (except for the vacuum). The terminators are very solid elements, made from gold plated copper, where the desired ending can be bolted to – spades, bananas or rings.